See PDF Article Links below! "American Folk Art Canes Soar in Value"
Forbes Magazine has recently reported a great art investment, American Folk Art Canes. These pieces of Americana have soared in value in the past few years. 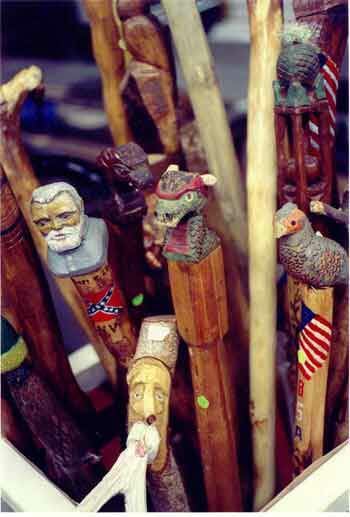 American Folk Art Canes were made mostly between 1800 and 1930, dwindling quickly as canes went out of style. 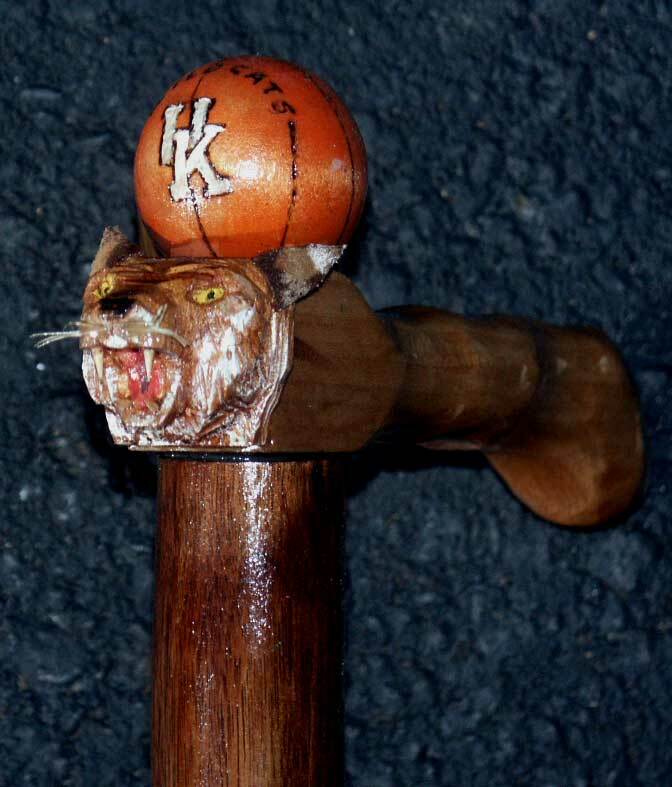 Folk art canes can be very crude to professionally made. They can be tree branches, root ball saplings, or a worked piece of lumber. The thing that distinguishes folk art canes is that they were all different, each one unique and personal, mostly made by the cane user. Those made for others were made by amateur carvers for friends and a limited few by professional carvers. 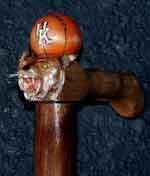 The professionally made canes are rare and very valuable pieces of beautiful art. As to value, most canes made in the 1930's are worth a thousand dollars and up, especially tramp art canes. Canes from 1900-1920 are $1500-2000. Canes depicting fraternal organizations such as the Masons Odd Fellows, G.A.R are around $2000-2500. Canes from the latter half of the 19th century are usually $1500-2000, with some professionally made canes like the Orions being $3000. Civil War era canes are now over $5000, one such cane recently selling for $7500 at Sotheby's Auction. Photo by Frank Jacobs of The Trenton Times: As seen in The Times article "Carving a Niche" this photo is a fantastic example of the variety of sticks Stan has created over the years. Contemporary cane making is not very common, although there are a few modern cane makers left who make canes for sale. Each has his or her own unique style, and canes made as little as 10 to 15 years ago have tripled in value. Most of the best folk are cane makers can be found in the Southeast, look for canes by Tom Wolf, Elisha Baker, Tim Lewis, and Danzil Goodpaster. In the Northeast, the premiere cane maker is Stanley Saperstein, a professional woodcarver and 18th century furniture maker. Mr. Saperstein started making canes about fifteen years ago, in doing so, he brought his highly trained carving skills to cane making. He produces several styles for different uses. They are broken down into Trail staffs, walking sticks, and canes. Trail staffs are made for rough terrain like the Appalachian Trail and are five feet in height or taller. Walking sticks are 40-48 inches, depending on the user's height, and are used for regular walking. Canes are 36 inches, and are available with or without a handle. 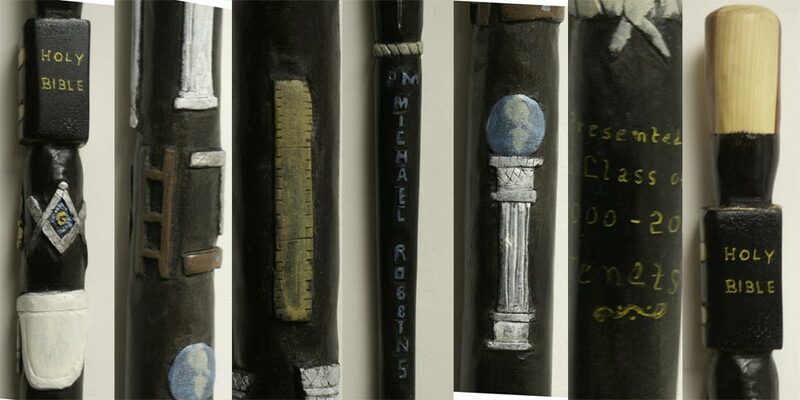 All of Mr. Saperstein's canes are carved with animal or human heads. Some historical figures like Washington or Lincoln; others are fantasy figures like wood spirits, leaf gnomes, and dragons. His root ball and branch canes with wood spirit faces are uniquely outstanding. Another distinguishing characteristic of his trail staffs, made from milled lumber, is their adornment with highly detailed head carvings that represent the outdoors. Trail staff carvings include Indians, mountain men, eagles, bears, wolves, goats, horses, and other wildlife. A recent article by Eric Saperstein is featured on the Phoenix Masonry Museum website, discussing the history of fraternal staffs and carvings. 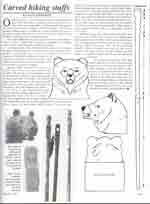 "Carved Hiking Staffs" by Stanley D. Saperstein introduces his new interest to the "Chip Chats" readers in 1997. "The History of Fraternal Canes & Walking Sticks" by Eric M Saperstein is featured online at the Phoenixmasonry Museam site. "American Folk Art Canes Sore in Value" This PDF format article, by Stanley D. Saperstein, focuses on antique walking sticks as an investment and heirloom. Trenton Times Article: "Carving A Niche" This feature article by Janet Purcell launched Artisans resurgence into active business January 3rd of 2002. Visit 1a-walking-sticks.com's online articles section for more information on the history of walking sticks, and of course, some of Artisans' feature articles.